There was a time when choosing your foundation without testing a blob or two of it on the back of your hand/side of your face/jawline pre-purchase would have been considered a cardinal sin. Fast-forward to 2017, and apps, online questionnaires and a newfound confidence with products that allow us to create our own bespoke formulas mean that dodging the makeup counters and going straight to checkout isn’t as bonkers as it sounds. All you need to do is follow the below guidelines and you’re good to go. Scroll down to discover how to buy foundation online. 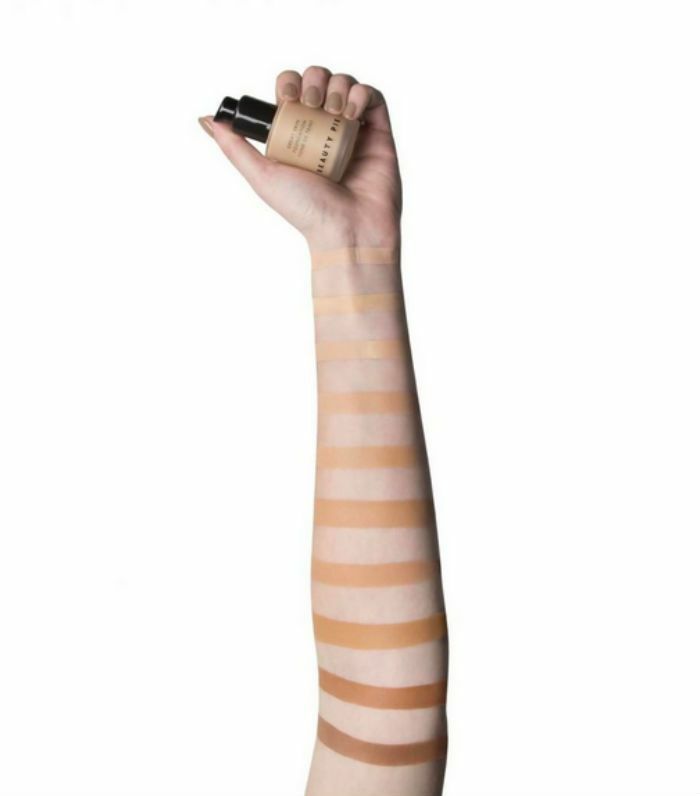 Whether you start with your skin tone or your formula is a bit chicken and egg, the last thing you want to do is spend hours nitpicking over a matte or dewy finish and then discover the foundation you think is your perfect match only has six shades, none of which are yours. What to consider? Your skin type—does your forehead look oilier than an anchovy by noon, or are you more concerned about those dry flaky patches around your nose and cheeks? If it’s the latter, go for a hydrating foundation, and eye up the ingredient list to see if it has skincare benefits squeezed into its formula too (things like vitamin E and hyaluronic acid). If it’s the other, your buzzwords should be mattifying and correcting. Next, ask yourself if you want a lightweight coverage that just evens things out a bit or a full-on foundation that will hide dark circles and spots on Insta without even going near a filter. Also consider the time of year and what you’ll be using your foundation for. If you’re off on your holidays, nab one with SPF and keep it light. If you’re on the invite list for a winter wedding, choose a long-wear formula. Just like the formula, you need to be happy with how you work with your foundation. A happy makeup marriage between you and your products is how it makes you feel, so if you love the silkiness of a fluid, stick with that. If you find you can get a more even finish by buffing in a mineral powder, don’t stray from your first love. Cushion compacts are the latest coup, creating a buildable and easily blendable coating; they’re lighter than a compact formula but not as thick as a long-wear. There are three options here—warm, cool and neutral. “Golden or warm tones have more of a yellow/olive tone, cool means more of a pink undertone, and if you are neutral, you are somewhere in between,” explains Sarah-Jane Froom, BareMinerals international makeup artist. You might already know which you are, but if you don’t, this is the only way you’re going to nail that natural look so get it right. Grab a hot pink and satsuma orange scarf/top/sock/lipstick, and hold them next to your face. If the orange makes your skin look glowy, you’re warm. If the pink makes your skin look luminous, you’re cool. If they both look fine, you’re neutral. The same test can be tried with silver and gold jewellery. The latter suits warm undertones best; if you’re cool, you’ll be all over the pewter palette. Other earmarks? If you tan easily and your veins look greeney, you’re warm. If you go rosy in the sun and have blueish veins, you’re cool. All you neutrals will have a mix. The internet is a wondrous thing. Not only does it mean you can buy your foundation without having to rugby-tackle your way through heavily made-up counter girls; you can find reams of information on your subject of choice. If you’ve managed to hone down your potential foundations to two or three, google the hell out of them. You’ll be able to see what people are saying about their longevity, coverage, texture and value for money. Ulta.com, Nordstrom.com, MakeupAlley.com and Sephora.com are all good sites to log on to. It’s worth watching a few YouTube videos on the products if you can too, just so you can visibly see how well the foundation applies and spreads across skin. Apps are another nifty tool you can use. Veleza has loads of beauty advice, but it also has a clever function that allows you to upload photos of the products you already use; after a few questions, it will whip up some unbiased foundation suggestions it feels most suited to you. A word of warning: Shade names differ depending on the brand. “Never assume the name for one foundation will be the same match for another,” advises Ariane Jaksch, acting education manager at Smashbox. Helpful much? Although using them as a reference is still a good trick to employ, continues Froom. It’s also where you need to get back on Google so you can take a look at the shades snapped on people’s skin: There’s only so much a smear on a white background can do. If you’re still in doubt, choose the shade that’s slightly lighter; you can always add a liquid bronzer or build up colour elsewhere with your makeup. It’s much easier to do it that way than tone down a foundation that’s too dark. Most brands now offer tailored questionnaires and surveys online so they can direct you to their foundation best suited to you—Estée Lauder, BareMinerals, Cover FX, for example. If you know you like a specific brand or have used a formula from them in the past that suits your skin, it’s the best place to start. There are a zillion foundations out there, but there’s a lot to be said for staying brand loyal too. Added to basket? Proceed to checkout and then swot up on how to apply your foundation so you can be an expert by the time it arrives in the post.